Policy implementation failures attract international headlines and undermine the credibility of political administrations. With national elections in both Canada and the UK in 2015, the Mowat Centre has partnered with the Institute for Government to look at how governments and their central agencies can effectively turn election pledges and policy proposals into real changes on the ground. 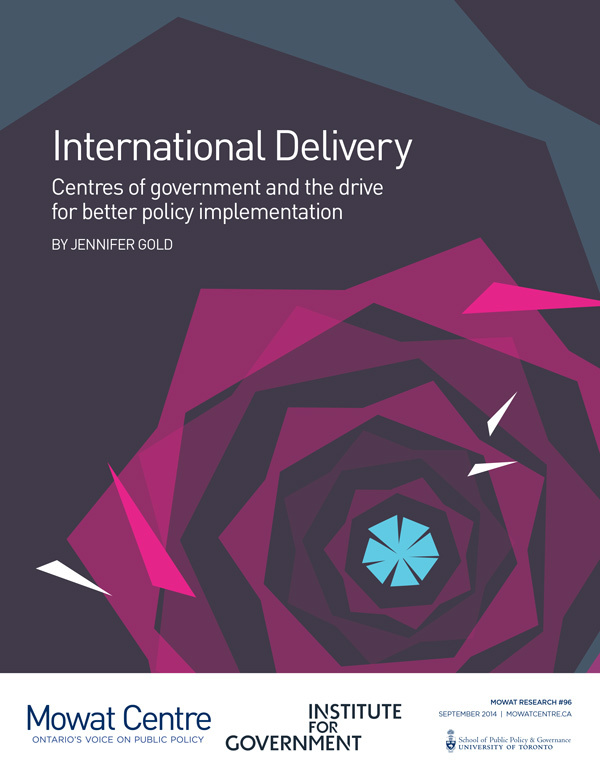 This report identifies areas where central departments in both countries need to strengthen their capability to oversee and support effective implementation across government. This report is the product of collaboration between the Institute for Government in the UK and the Mowat Centre in Canada. It recognizes the common international problem of turning election pledges and policy proposals into real changes on the ground. And it is particularly timely given the national elections that will take place next year in both countries. Heads of government need to consider how departments at the centre will oversee and support this implementation process. Traditionally, central agencies have focused on policymaking, but they are playing an ever greater role in correcting long-standing shortcomings in implementation performance across government. Both the Institute for Government and the Mowat Centre are committed to learning from the experience of other countries and administrations. This report offers an international survey of the central machinery that is emerging to support policy implementation. Four areas of activity are highlighted: implementation planning, chasing priorities, major projects management, and evaluation. To take one example, it is revealing that central agencies across a number of governments are seeking to improve the performance of large-scale, high-risk projects by introducing or strengthening central assurance systems, as well as centrally coordinating the deployment of project-delivery expertise where needed. This is particularly interesting in the UK context in view of the work of the Major Projects Authority and its leadership academy. International Delivery pays particular attention to developments in Canada and the UK, identifying the main strengths and weaknesses of both governments’ arrangements, while setting them in a broader international context. While the two countries have similar government institutions and parliamentary systems, they face very different capability gaps at the centre. For the Institute for Government, this study adds valuable international insights to our existing work on building a more effective Whitehall. It complements two recent reports: Centre Forward: Effective Support for the Prime Minister at the Centre of Government and Doing them Justice: Lessons from four case studies of policy implementation. For the Mowat Centre, this report provides a comparative perspective in which to situate our own work on how to make government smarter. It provides needed detail for our Shifting Gears series on how to transform government processes and structures to better align with Canada’s current challenges.